How to use Import From HTML Module? 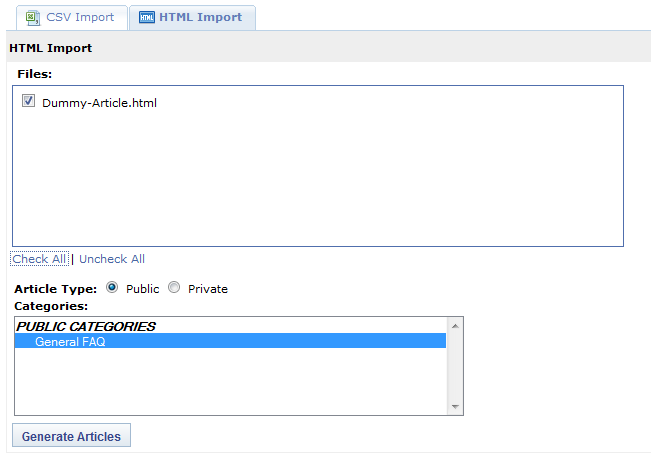 Please refer to the instructions below on how to use the "Import From HTML" module to import the HTML documents as articles in your knowledge base. It is an optional module available as a paid add-on to PHPKB knowledge base software. Please use the Total Doc Converter software to convert your DOC/DOCX files to HTML format as it is the best and most efficient utility to convert MS Word files to HTML format. Not only it preserves the formatting of your documents but also extracts all images. We have found it to be the best after testing various DOC to HTML conversion tools. You’re strongly advised not to use Microsoft Word itself to convert HTML files because it generates meaningless CSS and tags. Go to "Tools" section and click on "Import Data" link, clearly visible in the sub-menu as shown in the image below.